This post is going to deviate slightly from the normal theme of my posts on here, but it’s definitely going to stick to the theme of trying to save money. As you may have seen from my previous weekly spending posts, I had made a few purchases in preparation for a camping trip. My girlfriend and I took a week vacation by renting a cabin at Robert H. Treman State Park in Ithaca, NY. I know we both like to research where we are going so I figured if there are any camping enthusiasts (or looking to get into camping) in the area I would be able to assist in your own research with my own review! First I’d like to start out by saying that neither my girlfriend or me are expert campers, and we are definitely not talking about backpacking or parking at a trail head and camping into the forest. The extent of our camping knowledge is just with car camping. For those not familiar, this is where you pack as much as you can into your car and usually pull into a designated camping site at a park with your car with your tent pretty much right next to it (or close enough). Since we were going for a week this time, we decided to upgrade a bit this time and get a cabin so that any potential rain would not be as much of a hindrance. After first entering the park, we checked in at the park office. The ranger was very friendly and showed us exactly how to drive to our cabin, where the bathrooms and showers were, as well as pointing out how to get to the start of the trails and how to purchase firewood in the camp. The entrance to the camping area is pretty cool, as you actually get to “ford” your car across a tiny little stream. There is a central parking area for all the cabins and they supply wagons to bring all your stuff to the cabins. When we arrived at the actual cabin, it was locked with a padlock and the doors slide open kind of like barn style doors. Behind that is a pretty heavy duty screen door. Maybe our expectations going in were kind of low for the cabin, but it was actually really clean. The inside cabin consists of 4 beds, lights, a (small) full refrigerator with freezer, 4 shelves to put things on, and 6 outlets to charge everything or plug whatever you bring in. The outside of the cabin has a porch, a bench, a picnic table, and an open picnic style grill. If you are looking for a secluded campsite, this is not the place to go. You are definitely within shouting distance of your neighboring cabins – but don’t get me wrong – at no time did me and my girlfriend feel like we didn’t have privacy. They are a reasonable distance from each other. There are plenty of taps to get water from scattered about, and our cabin was pretty close to the bathrooms with some cabins being further than others. The bathrooms were cleaned daily and always stock with soap & toilet paper. The bathrooms by the cabins are cold water only and unfortunately don’t have showers. If you want to shower, you will have to walk a bit of a distance to the camping loop for that. It didn’t bother us too much, and if you really wanted you are able to park right outside this set of bathrooms. These bathrooms also contain larger basins for doing your dishes and all the showers and faucets in this facility contained hot water. The showers were relatively cleaned, and you could tell these bathrooms were cleaned daily too. Everything was well maintained for a state park and we had no complaints there. For people with kids, there are two playgrounds with one being in the day use area and an almost brand new one in the camping area near the cabins. There is also a swimming area with a diving board that is right below the falls! You will definitely need some sort of water shoes though, as the bottom is rocky. There are quite a few other state parks in the area as well. We took day trips to Buttermilk Falls State Park, Watkins Glen State Park, and Taughannock Falls State Park. 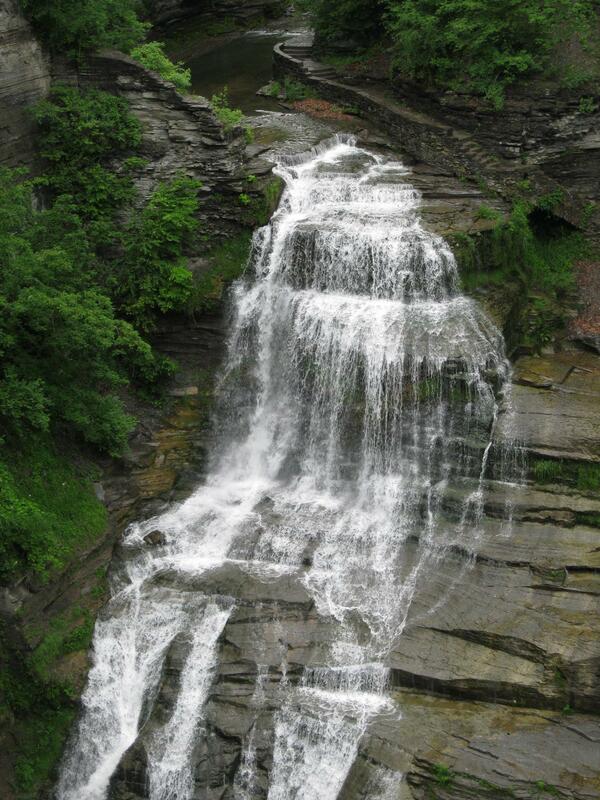 There is more waterfall swimming at Buttermilk Falls, swimming right on Cayuga Lake at Taughannock Falls, and a Olympic sized swimming pool at Watkins Glen. There is also plenty to see within the city of Ithaca if you get a day that doesn’t have the greatest weather. The trails at Robert H Treman State park are really nice, as well as all of the state parks in the surrounding area that we visited. I think our favorite trails would have been the gorge trail at Robert H Treman State Park as well as the gorge trail at Watkins Glen State Park. All of the waterfalls and the gorges themselves were amazing. None of the trails that we walked were overly difficult, but The trails definitely require some stamina if you plan on doing the whole “loop” at a park, with some being around 5-6 miles in total and having hundreds of steps. Most of the time we hiked our way up the trail, had a lunch we packed at the top at a picnic area, then hiked our way back down. If anyone plans on going to this park or anywhere nearby, feel free to leave a question and I’ll try to answer the best I can in more detail! Really loved your post. While I’ve rented a cabin at Treman a few times my husband’s never gone with me. I googled cabins at Treman and your post came up. It was enough to tip him in my favor! by the way, I’m debt free and loving it – keep plugging along! Glad I could help you out 🙂 It really is an amazing place to visit and the cabin definitely makes things more convenient! I was never that big of a hiker – I always pick my camping locations based on swimming as the #1 priority. This time we didn’t even get that much swimming in and the hiking was AMAZING at Treman and all the local parks. And thanks so much for your supportive words! I just visited Treman, I have never been and this is my first time visiting Ithaca. It was stunning. I took the opportunity to propose to my girlfriend when we got to the top. great hike and scenery next time i am going to rent a cabin especially after reading your post. a question where is the falls at on your second picture? i didn’t see that at Treman. That’s awesome, this trip was my first time visiting Ithaca as well. It’s really an amazing looking area and sounds like a great place to propose 🙂 The cabin made things easier for us especially we had a quite a few damp/wet days. The second picture is actually from Watkins Glen State Park, which you should definitely check out. The gorge is amazing! My girlfriend took that particular shot at the popular “Rainbow Bridge” there. 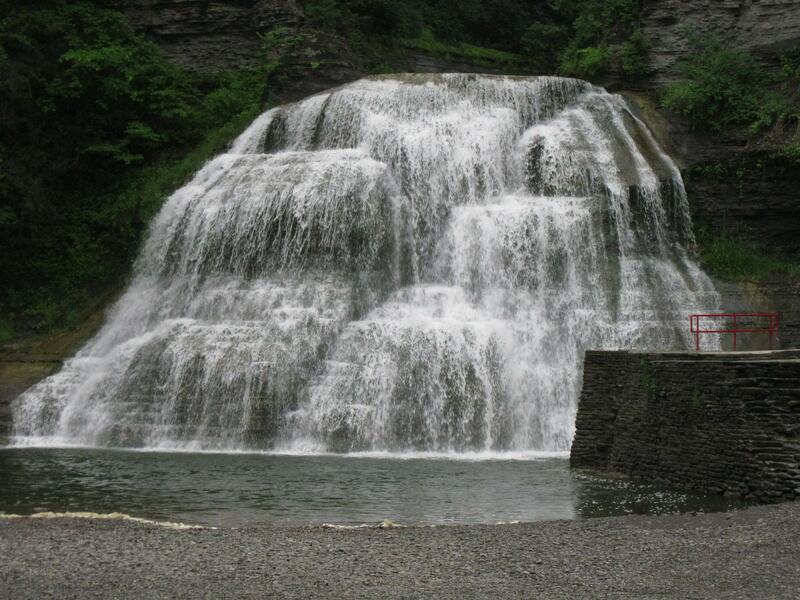 I would also recommend taking the drive to Taughannock Falls State Park as well. They should all be within 30 minute drive of Treman. Hope this helped! 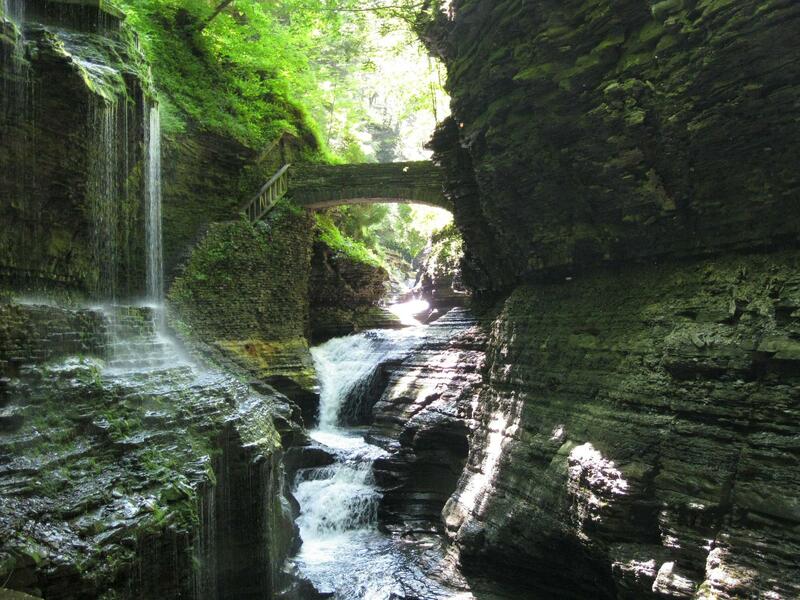 FYI – the second photo of your post isn’t from Treman, but from Watkins Glen State Park – an equally beautiful place!